A group of evangelical Christians yesterday issued a "manifesto" that suggested many followers of their branch of the faith have gotten too involved in partisan politics. To read it, click here. This, by the way, is one more indication of how diverse evangelicals are in the U.S. For the Baptist Press version of the story about the manifesto, click here. It's interesting to note that among the non-signers was anyone officially representing the Southern Baptist Convention. And for thoughts on the manifesto from Jim Wallis, author of God's Politics, click here. BROC -- BIG RELIGION ON CAMPUS? Speaking of evangelicalism, is it rebounding on college campuses? A piece in the Chroncle of Higher Education, cited on this Seattle Post-Intelligencer blog, suggests that it is. What's your experience of faith on campuses these days? I don't spend enough time there to know first hand. A faith community's home often tells people a lot about the congregation -- even in ways that members of that congregation haven't thought about a lot. 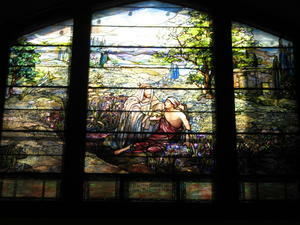 Last weekend, for instance, when author and scholar Diana Butler Bass spoke in the sanctuary of my church, she looked out toward the fabulous stained-glass window (pictured here) that depicts the parable of the Good Samaritan. She first said that it's too bad that only the preacher gets to look at the lovely window during a worship service because it's on the back wall of the sanctuary. So she jokingly suggested we might want to turn the pews around so all of us could look at it each Sunday morning. But, she said, the window almost certainly tells a lot about who we are as a congregation -- one devoted to looking after the needy. And that's true in many ways. But probably not many of us have thought about the window being a sign pointing to the nature of our congregation. Later Diana noted the stained-glass window in the back of our transept, off to one side of the sanctuary, and said that it, too, talks about who we are because it depicts a woman named Dorcas, or Tabitha, "who," Acts 9:36 says, "was always doing good and helping the poor." No doubt all of us in my congregation should pay better attention to all of our gorgeous stained glass and the stories they tell because partly they tell about us. What is there in your church, synagogue, mosque or temple that speaks a word about the nature of your congregation? And does it accurately reflect who you are now? P.S. : Yes, the world's focus this week has been on Burma, or Myanmar, because of the devastating storm and the way the foolish government there has stalled relief efforts. But let's also not forget the needs in Darfur. You have an opportunity in Kansas City on June 12 to hear John Prendergast, author of Not on Our Watch: The Mission to End Genocide in Darfur and Beyond. He'll be at Unity Temple that evening. The link I've given you will give you what you need to know to go. ANOTHER P.S. : For Mother's Day this year, the Memory-of.com site is offering to donate a dollar to the Susan G. Komen for the Cure group that works against beast cancer for each new visitor who comes to this site. Seems like a charitable gesture. To read my latest Kansas City Star work, click here. It may be interesting that no one from the S. Baptist Convention did not sign the manifesto against partisan politics. It is not surprising. It seems they have learned nothing, after their involvement in the election of Bush and letters and lobbying for the Iraq War. I am jaded enough to believe that the Dobson (and maybe Huffman: I don't know him) objections regarding lack of African-American participation is white-man code for, "But you're not asking those black folks to stop voting Democrat." The Ev'angel'ical Movement, is finally getting to understand, how much Christians are Patriotic to their Government, over their Allegiance to GOD/LIFE. What is Angelic about the Christian Right, or Government Division? Angels are Pacifists, like the Father of Life on Earth, and Jesus. Christian Religious Teachings, conflict with the Equal Religious Rules of Government. Evangelicals have tried since the 1960s to put their Members into Government, with their Religious Rules, starting with local governments up to our Federal Government. As long as Humans go to Church, and give Mouth Worship to God, and then try to Change Government Rules, with their Church teachings, we will not have Equality in Government in the USA. The Only 'Reason' for this Inequality, is Body Body Birth. 'Who' our Parents are, and 'What' their Lifestyle will be, resulting on 'Where' they are Born, is a Child's Lifestyle. No Child gets to pick their Life Experience, Good or Bad. Train up a Child and 'When' he is Old, he will not Depart from it, Good or Evil. So, 'When' Each Child cannot control their Input, for their Lifestyle until they are an Adult, for Many it is not Possible, To Change This Lifestyle Pattern. So, Where is the Angel Compassion for All the Unequal Humans on our Planet? We still Hate our Brothers/Sisters, because of where they were Born and who their Parents are. Look at Obama. He is very Compassionate, from his White and Black Life Experience. All most People see, is his Black Skin. So are we going to blow up our Planet with our Nuclear Bombs, because of our Hate to all our Brothers/Sisters of Life because of Where they were Born and Who their Parents are? Most campuses have slowly changed over the last twenty-five or so years. They are no longer the haven for the privileged or intellectually elite. Instead, they've become much more microcosms reflective of the world at large. The working and middle-aged student is common. That means that religion is more prominent, mostly in evangelical ministries. Thriving campus ministries, just like any ministry, are highly dependent on the attractiveness and effectiveness of the leadership. So I've been on campuses where the Methodist group was most active and those where the Catholic group was most active and a couple where UCC is prominent. I may have told this story before, but it shocked me during one lecture on demographics, when I asked my college class of young people which demographic they would put themselves into. The vast majority chose "their parents'" demographic. I came out of a generation that would have taken cyanide before aligning themselves with their parents. Along with wanting the income, many young people today also want their family's values and religion. This prompts a question that I have often asked myself when visiting your church's website, Bill. It is so close to the University campus, but I see no evidence of outreach or ministry. Is that a failing of the website or not a church priority? Or why is that? I work in campus ministry and am a student, so I see a cross-section of student life. One kid in our group is Christian with a Jewish father. He roomed with a couple guys: one was raised religious Jewish and is now secular, and the other is secular in upbringing and life. They got along fine with good-natured teasing all around. I also see a lot of Christianity-themed t-shirts around, and in the locker room I see plenty of cross tattoos. Christian groups are active, and not perceived de facto as crazy. Nevertheless, Christianity challenges everyday college life of excess and immediate gratification. Christian students are caught between these two pulls. All kinds of groups abound. Of course, the atheists and communists are around, too. I don't see much judgment of one group to another. This may come from what I've heard called the "whatever" generation: you do what's good for you and I'll do what's good for me. Patricia, you were certainly on a different campus, or a different planet than I was. I was neither ‘privileged or intellectually elite’ and neither were the other thousands of students. College campuses were “microcosms reflective of the world at large” forty years ago. Why Patricia, as a frequent contributor to Wikipedia, and apparently college instructor of your intellect do you respond to those who post here? Weren’t you the person complaining here last summer about outreach ministry. Bill’s church is located close to campus, is open to students and probably has a college age group. You want them to have an outreach and complain that active outreach offends you. Certainly I’m not an expert but you might qualify elitist and priviliged. Well. If I am the elitist, JT, then you might explain why I'm not the one who is pointing out some sort of disparity between myself and others on this blog. I love Bill's postings. It's one of the few places where you can actually be stimulated to think about important issues. I think he understands that I was not criticizing his church, but was curious. He kindly responded off-blog. And I am not one to question another's memory, but I have no problem with campus ministries. I just hate being chased by Evangelicals selling their God-wares. Whether it's on a campus or in a grocery store parking lot. OR as soon as I get comfortably settled in the club hot tub.